When Baron Reginald Fistcuffington Smythe discovered the new super-element hydrolium, he could have ushered in a new era of glorious technological achievement and peace. Instead, he built a massive airship powered by his discovery and traveled the world in search of able-bodied combatants to fight each other for his amusement. Baron Smythe, possessing unbelieveable technology and fantastic wealth, offered a lucrative reward to those who would become champion of “His Majesty’s Fisticuffs Bouts” — your greatest wish fulfilled. Fighters from the world over flocked to Baron Smythe’s flying boxing ring. Pugilists decided their fates with hooks and haymakers, spits and stomps; anything goes when you’re boxing in the sky! Previous Fisticuffs champions such as Jason “The Great” Gatsby (wished for fantastic wealth) and Ripjaw “The Bonesaw” Bloodsmash (wished for a quiet house in the suburbs) became famous for their deft footwork, masterful technique, and extravagant wishes. You are one of the fighters who has climbed aboard the Baron’s airship to participate in his most recent tournament. Can you become champion and get your greatest wish fulfilled? This is Fisticuffs! Welcome to “His Majesty’s Fisticuffs Bouts!” You are one of the pugilists who has been summoned to Baron Smythe’s floating airship, traveling all around and above the rest of the world, and you’re fighting to be the sole winner of a single wish! The very first thing you should do is select your character. Eight different characters come in the box for Fisticuffs!, each with their own backstory, wish, and power. All have been designed to be powerful, though some may lend themselves to more seasoned players. When choosing your character for the first time, just select whichever character looks interesting to you. Read their special power, and be sure to remember to use it — it might make all the difference. Once everyone has selected their character, all fighters should receive a Health Counter Card that can be placed under their Character Card. By moving the character down as you take hits, you can keep track of how much health you have left. A fighter’s starting health is 12, and a fighter cannot have more health than they start with. A fighter is selected to go first as local custom dictates - we prefer the player with the best battle cry, but oldest player or highest roll of a die works too. That fighter receives the Bell Token and the Glove Token. All fighters also receive Reference Cards to help remind them of turn and Brawl order. Each fighter then draws a hand of five Punch Cards. Once all fighters are ready, play moves to the first round! During a fighter’s turn, they must start a Brawl if able (See Brawlin’! below). Before a Brawl is started, any fighter may play Feint cards. During a Brawl, any fighter may play Parry cards. Once the Brawl ends, the current fighter’s turn is over and they pass the Glove Token to their left. However, the fighter whose turn is first in the round will keep the Bell Token. The fighter who just received the Glove Token now begins their turn. When the fighter holding the Bell Token receives the Glove Token, they do not take a turn - instead, this signifies the end of the round, and fighters return to their corners to rest up and prepare for the next bout! If a fighter ever begins their turn with no cards in their hand, they draw one Punch Card and end their turn immediately. During a fighter’s turn, they must start a Brawl if able. A Brawl is started when the fighter whose turn it is plays a Punch Card targeting a fighter or a Rush card. Let’s take a look at a Punch Card. There are three important parts to a Punch Card: the Type (in this case, a Haymaker), the Color (in this case, Red), and how much Health it removes when it lands (in this case, 5, which is a lot!). When a fighter plays a Punch Card, the targeted fighter gets a chance to Block it, which they can do if they have a card in their hand that is the same Type as the Punch Card. After a successful Block has been made, that same fighter now has the ability to Counter it, targeting any fighter currently involved in the Brawl, with a Punch Card of the same Color as the Block. If the fighter who was targeted does not have a Block to play (or does not wish to play a Block), then they must say “Towel,” opening up the Punch to be blocked by anyone else at the table — whoever gets their card to the Brawl pile first. If someone does, they become involved, allowing them to be targeted in the Brawl, and can now follow up with a Counter of their own, targeting any other fighter involved in the Brawl. If the fighter who played the Block does not have a Counter to play (or does not wish to play a Counter), then they must say “Towel,” opening up the Block to be countered by anyone else at the table, whoever gets their card to the Brawl pile first. If someone does, they become involved and can be targeted in the Brawl. The Brawl can then continue with more Blocks and more Counters as fighters choose to play them. Fighters lose health from Punches and Counters that are not Blocked (this can be tracked on your Health Counter Card) equal to the number on the unblocked card. You cannot Punch yourself, and you cannot Block your own Punch or Counter! Remember, the steps to a good Brawl are PUNCH - BLOCK - COUNTER - BLOCK - COUNTER - BLOCK -COUNTER ... ! Once the Glove Token returns to the fighter who started the round (the one holding the Bell Token), the current round ends. This gives every fighter a chance to recharge their hand for the next round. Each fighter is dealt one Round Card that is immediately added to their hand. Then, any fighter with less than six cards in their hand must draw Punch Cards until they have a total of six cards, including Round Cards. If either deck runs out, keep the top five cards of the discard pile in the discard pile, then shuffle the rest into a new deck. Fighters have no maximum hand size. Once all fighters have drawn cards, both the Bell Token and the Glove Token are passed one fighter to the left. The fighter who received the Bell Token and Glove Token begins their turn and the new round, passing the tokens as turns and rounds pass. 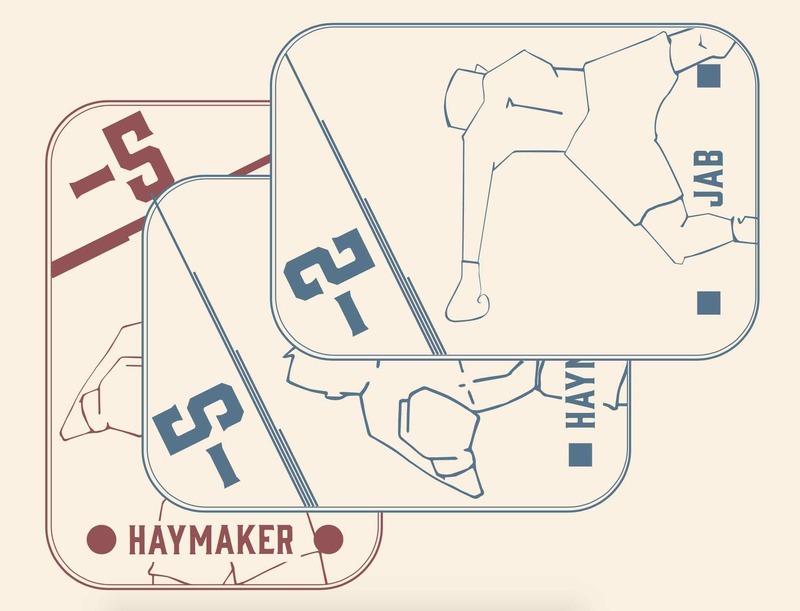 Fighters lose health from Punches and Counters that are not Blocked equal to the number on the card (this can be tracked on your Health Counter Card). When a fighter loses all of their health, they are Knocked Out and are out of the game. The fighter who dealt the final blow to the fallen fighter gets to select a random card from that fighter’s hand, and the rest of the cards get discarded into their appropriate discard piles. Once there are only two fighters left, Close Combat is initiated. Immediately remove the Bell Token from the game, as this is the final round. The fighter who would get the Glove Token next in order begins this round. At the beginning of each fighter’s turn, the fighter with the Glove Token draws one Punch Card. At the end of each fighter’s turn, the Glove Token moves to the other fighter. Close Combat continues until one fighter is left standing. That fighter is the winner of Fisticuffs! THE TIPS AND THE THANKS! A fighter is involved in the Brawl if they started it, were targeted by the first Rush or Punch Card, or have voluntarily inserted themselves into the Brawl through Blocking or Countering for another fighter. A fighter can also insert themselves into the Brawl by playing a Round Card or by using an ability that targets another fighter. While some characters might seem stronger than others, remember that each power has its own rewards and also carries certain risk. For example, if The Lion Son uses his Courageous Charge special power too often to draw a lot of cards, he might begin to paint a target on his back from other envious fighters ... though he might also develop some unlikely friendships from those he chooses to defend. Alternatives to keeping track of your health include using a 12-sided die or a life-keeping app (we recommend Lifelink from our friends at Pandamonia LLC). For an FAQ, sample game play, and rule clarifications, please visit www.nerdologues.com/fisticuffs. There are also podcasts and videos there you might enjoy! This was a game made by The Nerdologues, a comedy collective from Chicago, and funded initially on Kickstarter by 598 amazing people. We want to extend a big thanks to Shari at AdMagic for working with us newbies, Max Temkin and Cards Against Humanity for their advice and support, the “Nerd-o-lawyers” and game designers Edward Soderberg and Danny Bass, and, of course, all of our families and friends for being supremely rad individuals who have supported us doing dumb things for far too long. Please update your addresses if you haven't yet! Week six of our character introductions brings the haymakerin' hammerin' hunk, the security guard, Gene the Gorilla, otherwise known as The Congo Bongo. Great news! Things are rolling here at Nerdologues HQ as we're nearing getting the game into your hands! Just so we have some transparency about how the game will get to you, we made a small rush printing to make sure the games looked good and were up to snuff before sending off for the final print job. Our full print is being done through AdMagic, and will be shipped on a boat to the States, where it will go to a warehouse in Indiana and be shipped from there to you. We're still ironing out the exact details, and once we have more we'll get them to you! So far, everything is moving right on schedule. Because we're getting closer to shipping the games to you, if you have moved since we sent out the backer survey requesting your address, you need to update your address or else your game might not get to you! The PDF was also released last week to all of our backers! Hooray! If you missed it, do a quick search in your email for the last backer update from us, or take a look at the Kickstarter's update page for the message letting you know how to download/print a copy on your own. Week five of our character introductions delivers the dashing deviant dynamo, the saxophone-playing, trick card magician, Theo Thomas, otherwise known as The Saxomagician. We've finally recovered from PAX and Labor Day and are back in the swing of things! First of all, thank you so much to all of the people who stopped by the booth while we were at PAX, demoed the game, or bought an early copy! You're all a bunch of champions (and for those of you who won during your demo games, you're double champions). We had so much fun getting the game seeing people's reaction to the game and knocking each other around - it was a hit! Secondly, a big thanks goes out to everyone who came to our shows - you all are awesome - as well as to Cards Against Humanity (for putting the space together) and Improvised Star Trek (for flying as our wingman for those shows). If you missed them, well, you really missed out on some cool stuff! We also finished the PDF for our backers! We will send out another backer update soon with the link and basic instructions on how to print and play with your digital copy of the game (hint: it involves going to Kinkos and asking them to print it). Picking up where we left off with character introductions, week four brings us the bronzed bashing battler, the prize fighter of Baron Smythe himself, Steam-0, otherwise known as The Metal Devil. We'll be at PAX Prime in Seattle this weekend! Because of you awesome backers, we were able to rush print a small amount of games to bring with us, and we'll be demoing and selling those extra copies of the game as part of the PAX-adjacent Cards Against Humanity store in the ACT Theatre! If you've backed the game and you'll be at PAX, you can stop by and let us know and we can give you your backed copy right there! We'll also be performing in multiple comedy shows this weekend in that same space - stop by the store to get a program of the weekend's events. We'll be doing our trademark brand of stupid sketch comedy (re: fart jokes), as well as some Cards Against Humanity improv shows with the game's creators, like we did for the past few years. Fun stuff! However, because of the trip, we might not be able to send out the Character Update on next Tuesday since we'll be in transit back to Chicago. :( We'll do our best! Additional cool news - we're almost ready to release the PDF of the game to all of our backers! Once we're back from this weekend's trip, it will be our next priority. Stay tuned! Week three of our weekly character previews introduces the marvelous and mighty marsupial Archie the Kangaroo, otherwise known as The Thunder From Down Under. First, some good news! We ordered a small batch of the game to see how the print came out, and the good news is that they came out perfect! We're really excited to get them to you, and the rest are on their way. We'll be at two places this Saturday demoing the game, if you're in Chicago and want to play! We'll have a crew at BitBash as part of the Cards Against Humanity’s Quiet Fun Sit Down Lounge (Tabletop Section) - so swing by and say hi after checking out all the cool stuff there is to offer there. We'll also have another crew at the Chicago Southland Mini Maker Faire with our own table, so you have two chances to see us and the game this weekend! No excuses! Week two of our weekly character previews introduces the statuesque, stately slugger Annie Columbia, otherwise known as The Lady of Liberty. This is the first of our eight weekly updates about the characters of Fisticuffs! In these updates we'll give you a bit of background about the eight world warriors who inhabit the world of Fisticuffs! and some handy tips and tricks for playing as them from our team, to give you a bit of a head start on your competition. Our first fighter is the battlin' Burt Reynolds look-a-like, the clobberin' Clifton Walker Jr., otherwise known as The Lion Son.